The Dan Wesson Airsoft Revolver 4" Silver is the shortest of the Dan Wesson line of revolvers. With a full metal construction and sleek silver finish, the Dan Wesson Airsoft Revolver 4" Silver looks and feels like the real thing. 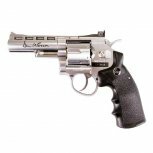 The Dan Wesson Airsoft Revolver 4" Silver runs off of a single 12 gram CO2 cartridge located in the grip, which can be changed in seconds on the field. Loading your Dan Wesson Airsoft Revolver is the best part. BBs are loaded into realistic bullet shells, and then you can either chamber them one by one, or use the included speed loader to load all 6 bullets at once! Very nice gun. Quite difficult to move grip to replace CO2. Gets easier with use. I own 4 airsoft guns and this easily matches for fit and finish. Gun shot a little to the right at first but the sight is easily adjusted. Powerful, and can easily perforate pop cans at about 30 ft.